Some people install a new WordPress site more often than they change their underwear. And some people, of course, might install a WordPress site only once or twice in their lives. Getting started with a WordPress-powered website can be a daunting and overwhelming task. There are thousands of resources on the Internet that describe how to build your site and they can get a bit confusing for a novice. This is not very user friendly and Google recommends using other formats so search engines can locate your content better. For instance, using your post’s title as the permalink looks better on screen: http://www.yourwebsite.com/my-first-post. You can change your permalinks by going to Settings > Permalinks. It is also important to do this at the very start. Changing permalinks later on when you already have a lot of content will affect your site traffic and trackback data. Akismet comes with WordPress which eliminates comment and Trackback spams without your interaction. To activate that, you need API key from Akismet It is free you can get it from Akismet.com/get. Go to Akismet Configuration and enter API key to activate it. If you look at the HTML source code of your WordPress site, you will find a couple of meta tags that aren’t really required. For instance, the version of WordPress software running on your server can be easily retrieved by looking at your source header. 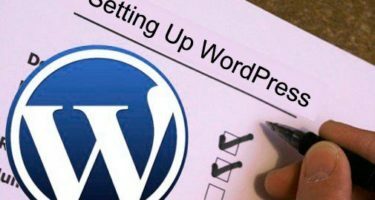 This information is like a good hint to WordPress hackers who are looking to target blogs that are using the older and less secure versions of WordPress software. To completely remove the version number and other non-essential meta-data from your WordPress header, add this snippet to your functions.php file found in the WordPress themes folder. Since you would not like anyone to browse your WordPress files and folders using the explorer view in web browsers, add the following line to your .htaccess file that exists in your WordPress installation directory. Also make sure that there’s a blank index.php in the wp-content/themes and wp-content/plugins folder of your WordPress directory. When you’re still in the very early stages of tweaking your website, you don’t want everyone to see it just yet. This is where a Coming Soon or Under Construction plugin would come in handy. These plugins direct your visitors to a static page telling them that the website is not fully launched yet. To view your pre-launch page, you will need to log out your WordPress account. To view your actual site, you need to log back in. You can disable the plugin when you’re ready to launch your site. This is highly recommended. If someone gets hold of your WordPress credentials, they will still need your mobile phone to get into your WordPress dashboard. Unlike Dropbox or Google, 2-step authentication isn’t part of WordPress yet but you can always use plugins. Authy is popular for enabling 2-factor authentication though I prefer Authenticator since it can be used with the official Google Authenticator app. A favicon is the little logo that appears beside your website name on a browser tab. Depending on your web host, the default favicon can be a generic logo that you can never use for your site. A customized favicon is essential for your site’s branding and identity. The fastest way to change the favicon is to use a plugin (there are lots of them in WordPress.org) which lets you upload your own image. The ideal size for a favicon is 60 x 60 pixels, in .ico or .png format. After you have installed your WordPress theme and Plugins, Delete all unused Themes and Plugins. It will improve your WordPress Performance as well as reduce the server load.